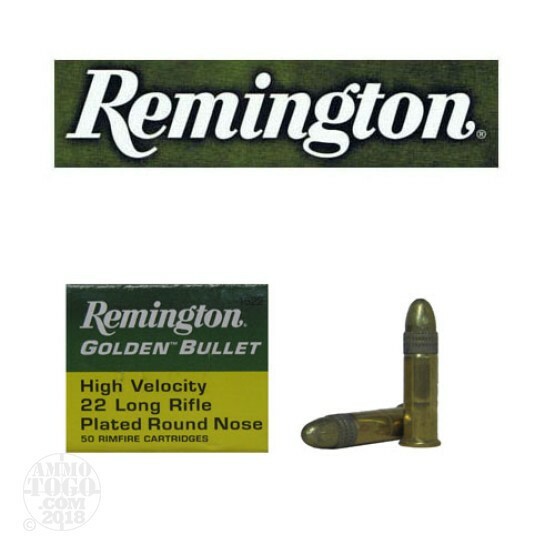 Perfect for high-volume target shooting and casual backyard plinking, this package contains 500 rounds of affordable Remington Golden Bullet .22 LR ammunition. Each round is loaded with a 40 grain copper-plated round nose projectile. With a special copper plating covering the soft lead nose, these rounds reduce lead residue in your gun barrel. Use these clean-shooting rounds and you’ll spend less time cleaning your firearm and more time shooting it. For more than 200 years, Remington has been one of the most-trusted names in shooting. With a rich history of excellence, Remington combines tradition and innovation to set the industry standard for performance and reliability. Remington’s Golden Bullet ammunition is specially engineered for easy cycling and solid performance for both modern and traditional .22 long rifles. This rimfire ammunition is factory fresh, non-corrosive, reloadable, and features premium brass casings. Each round leaves the muzzle at a velocity of 1255 feet per second with 140 foot pounds of muzzle energy.